NAMI advocates for access to services, treatment, supports and research and is steadfast in its commitment to raising awareness and building a community of hope for all of those in need. NAMI Flagstaff is the local affiliate of NAMI and NAMI Arizona, supporting the Flagstaff community. 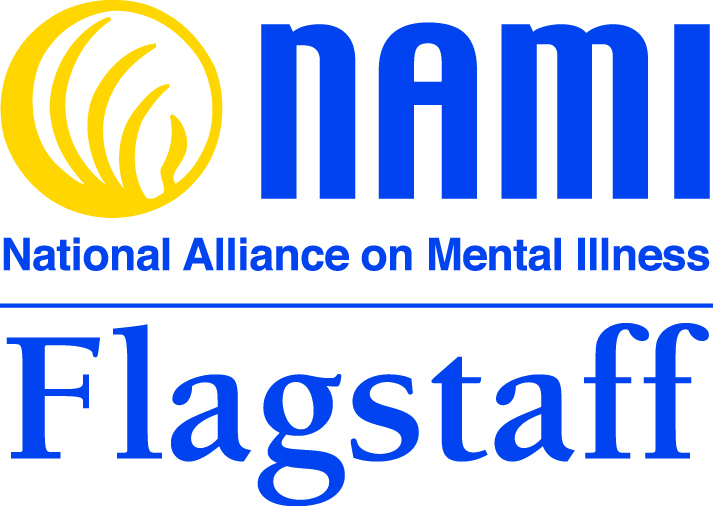 Through the compassionate and dedicated efforts of its members, volunteers and leadership, NAMI Flagstaff raises awareness and provides essential education, advocacy, and support group programs for people living with mental illness and their loved ones. NAMI Flagstaff addresses the mental illness needs of our community, replaces stigma with understanding, and helps thousands of families and individuals each year. Join us. Care with us. Smile with us. Heal with us. We welcome anyone with an interest in improving the lives of people living with mental illness. Membership offers a variety of benefits. People and families living with mental illness become members to find hope and healing through support groups and regularly scheduled classes. People who care about better attitudes toward mental health become members to advocate for a thriving community by reducing mental health stigma that impairs the quality of life for all of us. If you have an interest in any of these healing experiences, become a member, volunteer, and donate! Help expand our group of compassionate leaders who are making a healthy impact on the Flagstaff community. Click here to access the membership and donation form. To volunteer for a committee, email admin@nami-flagstaff.org and let us know about your interest and skills.